For other uses, see Schrödinger's cat (disambiguation). 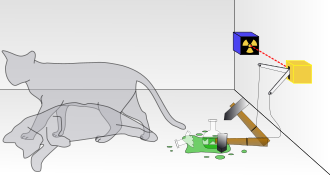 Schrödinger's cat: a cat, a flask of poison, and a radioactive source are placed in a sealed box. If an internal monitor (e.g. Geiger counter) detects radioactivity (i.e. a single atom decaying), the flask is shattered, releasing the poison, which kills the cat. The Copenhagen interpretation of quantum mechanics implies that after a while, the cat is simultaneously alive and dead. Yet, when one looks in the box, one sees the cat either alive or dead, not both alive and dead. This poses the question of when exactly quantum superposition ends and reality collapses into one possibility or the other. 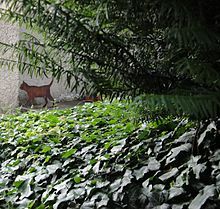 Life-size cat figure in the garden of Huttenstrasse 9, Zurich, where Erwin Schrödinger lived 1921–1926. Depending on the light conditions, the cat appears either alive or dead. Schrödinger intended his thought experiment as a discussion of the EPR article—named after its authors Einstein, Podolsky, and Rosen—in 1935. The EPR article highlighted the counterintuitive nature of quantum superpositions, in which a quantum system such as an atom or photon can exist as a combination of multiple states corresponding to different possible outcomes. The prevailing theory, called the Copenhagen interpretation, says that a quantum system remains in superposition until it interacts with, or is observed by the external world. When this happens, the superposition collapses into one or another of the possible definite states. The EPR experiment shows that a system with multiple particles separated by large distances can be in such a superposition. Schrödinger and Einstein exchanged letters about Einstein's EPR article, in the course of which Einstein pointed out that the state of an unstable keg of gunpowder will, after a while, contain a superposition of both exploded and unexploded states. To further illustrate, Schrödinger described how one could, in principle, create a superposition in a large-scale system by making it dependent on a quantum particle that was in a superposition. He proposed a scenario with a cat in a locked steel chamber, wherein the cat's life or death depended on the state of a radioactive atom, whether it had decayed and emitted radiation or not. According to Schrödinger, the Copenhagen interpretation implies that the cat remains both alive and dead until the state has been observed. Schrödinger did not wish to promote the idea of dead-and-alive cats as a serious possibility; on the contrary, he intended the example to illustrate the absurdity of the existing view of quantum mechanics. However, since Schrödinger's time, other interpretations of the mathematics of quantum mechanics have been advanced by physicists, some of which regard the "alive and dead" cat superposition as quite real. Intended as a critique of the Copenhagen interpretation (the prevailing orthodoxy in 1935), the Schrödinger's cat thought experiment remains a defining touchstone for modern interpretations of quantum mechanics. 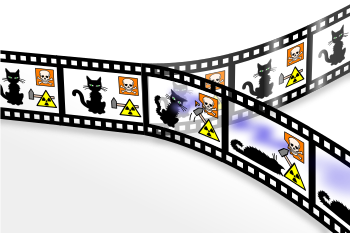 Physicists often use the way each interpretation deals with Schrödinger's cat as a way of illustrating and comparing the particular features, strengths, and weaknesses of each interpretation. Note that the charge of gunpowder is not mentioned in Schrödinger's setup, which uses a Geiger counter as an amplifier and hydrocyanic poison instead of gunpowder. The gunpowder had been mentioned in Einstein's original suggestion to Schrödinger 15 years before, and Einstein carried it forward to the present discussion. Since Schrödinger's time, other interpretations of quantum mechanics have been proposed that give different answers to the questions posed by Schrödinger's cat of how long superpositions last and when (or whether) they collapse. A commonly held interpretation of quantum mechanics is the Copenhagen interpretation. In the Copenhagen interpretation, a system stops being a superposition of states and becomes either one or the other when an observation takes place. This thought experiment makes apparent the fact that the nature of measurement, or observation, is not well-defined in this interpretation. The experiment can be interpreted to mean that while the box is closed, the system simultaneously exists in a superposition of the states "decayed nucleus/dead cat" and "undecayed nucleus/living cat", and that only when the box is opened and an observation performed does the wave function collapse into one of the two states. However, one of the main scientists associated with the Copenhagen interpretation, Niels Bohr, never had in mind the observer-induced collapse of the wave function, as he did not regard the wave function as physically real, but a statistical tool; thus, Schrödinger's cat did not pose any riddle to him. The cat would be either dead or alive long before the box is opened by a conscious observer. 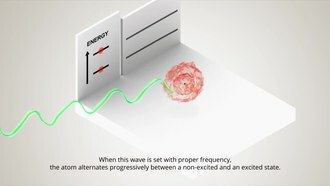 Analysis of an actual experiment found that measurement alone (for example by a Geiger counter) is sufficient to collapse a quantum wave function before there is any conscious observation of the measurement, although the validity of their design is disputed. The view that the "observation" is taken when a particle from the nucleus hits the detector can be developed into objective collapse theories. The thought experiment requires an "unconscious observation" by the detector in order for waveform collapse to occur. In contrast, the many worlds approach denies that collapse ever occurs. The quantum-mechanical "Schrödinger's cat" paradox according to the many-worlds interpretation. In this interpretation, every event is a branch point. The cat is both alive and dead—regardless of whether the box is opened—but the "alive" and "dead" cats are in different branches of the universe that are equally real but cannot interact with each other. In 1957, Hugh Everett formulated the many-worlds interpretation of quantum mechanics, which does not single out observation as a special process. In the many-worlds interpretation, both alive and dead states of the cat persist after the box is opened, but are decoherent from each other. In other words, when the box is opened, the observer and the possibly-dead cat split into an observer looking at a box with a dead cat, and an observer looking at a box with a live cat. But since the dead and alive states are decoherent, there is no effective communication or interaction between them. When opening the box, the observer becomes entangled with the cat, so "observer states" corresponding to the cat's being alive and dead are formed; each observer state is entangled or linked with the cat so that the "observation of the cat's state" and the "cat's state" correspond with each other. Quantum decoherence ensures that the different outcomes have no interaction with each other. The same mechanism of quantum decoherence is also important for the interpretation in terms of consistent histories. Only the "dead cat" or the "alive cat" can be a part of a consistent history in this interpretation. Decoherence is generally considered to prevent simultaneous observation of multiple states. A variant of the Schrödinger's cat experiment, known as the quantum suicide machine, has been proposed by cosmologist Max Tegmark. It examines the Schrödinger's cat experiment from the point of view of the cat, and argues that by using this approach, one may be able to distinguish between the Copenhagen interpretation and many-worlds. The ensemble interpretation states that superpositions are nothing but subensembles of a larger statistical ensemble. The state vector would not apply to individual cat experiments, but only to the statistics of many similarly prepared cat experiments. Proponents of this interpretation state that this makes the Schrödinger's cat paradox a trivial matter, or a non-issue. This interpretation serves to discard the idea that a single physical system in quantum mechanics has a mathematical description that corresponds to it in any way. The relational interpretation makes no fundamental distinction between the human experimenter, the cat, or the apparatus, or between animate and inanimate systems; all are quantum systems governed by the same rules of wavefunction evolution, and all may be considered "observers". But the relational interpretation allows that different observers can give different accounts of the same series of events, depending on the information they have about the system. The cat can be considered an observer of the apparatus; meanwhile, the experimenter can be considered another observer of the system in the box (the cat plus the apparatus). Before the box is opened, the cat, by nature of its being alive or dead, has information about the state of the apparatus (the atom has either decayed or not decayed); but the experimenter does not have information about the state of the box contents. In this way, the two observers simultaneously have different accounts of the situation: To the cat, the wavefunction of the apparatus has appeared to "collapse"; to the experimenter, the contents of the box appear to be in superposition. Not until the box is opened, and both observers have the same information about what happened, do both system states appear to "collapse" into the same definite result, a cat that is either alive or dead. In the transactional interpretation the apparatus emits an advanced wave backward in time, which combined with the wave that the source emits forward in time, forms a standing wave. The waves are seen as physically real, and the apparatus is considered an "observer". In the transactional interpretation, the collapse of the wavefunction is "atemporal" and occurs along the whole transaction between the source and the apparatus. The cat is never in superposition. Rather the cat is only in one state at any particular time, regardless of when the human experimenter looks in the box. The transactional interpretation resolves this quantum paradox. The Zeno effect is known to cause delays to any changes from the initial state. On the other hand, the anti-Zeno effect accelerates the changes. For example, if you peek a look into the cat box frequently you may either cause delays to the fateful choice or, conversely, accelerate it. Both the Zeno effect and the anti-Zeno effect are real and known to happen to real atoms. The quantum system being measured must be strongly coupled to the surrounding environment (in this case to the apparatus, the experiment room ... etc.) in order to obtain more accurate information. But while there is no information passed to the outside world, it is considered to be a quasi-measurement, but as soon as the information about the cat's well-being is passed on to the outside world (by peeking into the box) quasi-measurement turns into measurement. Quasi-measurements, like measurements, cause the Zeno effects. Zeno effects teach us that even without peeking into the box, the death of the cat would have been delayed or accelerated anyway due to its environment. According to objective collapse theories, superpositions are destroyed spontaneously (irrespective of external observation), when some objective physical threshold (of time, mass, temperature, irreversibility, etc.) is reached. Thus, the cat would be expected to have settled into a definite state long before the box is opened. This could loosely be phrased as "the cat observes itself", or "the environment observes the cat". Objective collapse theories require a modification of standard quantum mechanics to allow superpositions to be destroyed by the process of time evolution. The experiment as described is a purely theoretical one, and the machine proposed is not known to have been constructed. However, successful experiments involving similar principles, e.g. superpositions of relatively large (by the standards of quantum physics) objects have been performed. These experiments do not show that a cat-sized object can be superposed, but the known upper limit on "cat states" has been pushed upwards by them. In many cases the state is short-lived, even when cooled to near absolute zero. A "cat state" has been achieved with photons. A beryllium ion has been trapped in a superposed state. An experiment involving a superconducting quantum interference device ("SQUID") has been linked to the theme of the thought experiment: "The superposition state does not correspond to a billion electrons flowing one way and a billion others flowing the other way. Superconducting electrons move en masse. All the superconducting electrons in the SQUID flow both ways around the loop at once when they are in the Schrödinger's cat state." A piezoelectric "tuning fork" has been constructed, which can be placed into a superposition of vibrating and non vibrating states. The resonator comprises about 10 trillion atoms. An experiment involving a flu virus has been proposed. An experiment involving a bacterium and an electromechanical oscillator has been proposed. Wigner's friend is a variant on the experiment with two human observers: the first makes an observation on whether a flash of light is seen and then communicates his observation to a second observer. The issue here is, does the wave function "collapse" when the first observer looks at the experiment, or only when the second observer is informed of the first observer's observations? In another extension, prominent physicists have gone so far as to suggest that astronomers observing dark energy in the universe in 1998 may have "reduced its life expectancy" through a pseudo-Schrödinger's cat scenario, although this is a controversial viewpoint. ^ a b c Schrödinger, Erwin (November 1935). "Die gegenwärtige Situation in der Quantenmechanik (The present situation in quantum mechanics)". Naturwissenschaften. 23 (48): 807–812. Bibcode:1935NW.....23..807S. doi:10.1007/BF01491891. ^ Moring, Gary (2001). The Complete Idiot's Guide to Theories of the Universe. Penguin. pp. 192–193. ISBN 1440695725. ^ Gribbin, John (2011). In Search of Schrodinger's Cat: Quantum Physics And Reality. Random House Publishing Group. p. 234. ISBN 0307790444. Archived from the original on 2015-05-17. ^ Greenstein, George; Zajonc, Arthur (2006). The Quantum Challenge: Modern Research on the Foundations of Quantum Mechanics. Jones & Bartlett Learning. p. 186. ISBN 076372470X. Archived from the original on 2015-05-18. ^ a b Tetlow, Philip (2012). Understanding Information and Computation: From Einstein to Web Science. Gower Publishing, Ltd. p. 321. ISBN 1409440400. Archived from the original on 2015-05-19. ^ Herbert, Nick (2011). Quantum Reality: Beyond the New Physics. Knopf Doubleday Publishing Group. p. 150. ISBN 030780674X. Archived from the original on 2015-05-18. ^ Charap, John M. (2002). Explaining The Universe. Universities Press. p. 99. ISBN 8173714673. Archived from the original on 2015-05-18. ^ a b Polkinghorne, J. C. (1985). The Quantum World. Princeton University Press. p. 67. ISBN 0691023883. Archived from the original on 2015-05-19. ^ Trimmer, John D. (1980). "The Present Situation in Quantum Mechanics: A Translation of Schrödinger's "Cat Paradox" Paper". Proceedings of the American Philosophical Society. 124 (5): 323–338. JSTOR 986572. Reproduced with some inaccuracies here: Schroedinger: "The Present Situation in Quantum Mechanics." 5. Are the Variables Really Blurred? ^ Maxwell, Nicholas (1 January 1993). "Induction and Scientific Realism: Einstein versus van Fraassen Part Three: Einstein, Aim-Oriented Empiricism and the Discovery of Special and General Relativity". The British Journal for the Philosophy of Science. 44 (2): 275–305. doi:10.1093/bjps/44.2.275. JSTOR 687649. ^ Wimmel, Hermann (1992). Quantum physics & observed reality: a critical interpretation of quantum mechanics. World Scientific. p. 2. ISBN 978-981-02-1010-6. Archived from the original on 20 May 2013. Retrieved 9 May 2011. ^ Faye, J (2008-01-24). "Copenhagen Interpretation of Quantum Mechanics". Stanford Encyclopedia of Philosophy. The Metaphysics Research Lab Center for the Study of Language and Information, Stanford University. Retrieved 2010-09-19. ^ Carpenter RHS, Anderson AJ (2006). "The death of Schroedinger's cat and of consciousness-based wave-function collapse" (PDF). Annales de la Fondation Louis de Broglie. 31 (1): 45–52. Archived from the original (PDF) on 2006-11-30. Retrieved 2010-09-10. ^ Okón E, Sebastián MA (2016). "How to Back up or Refute Quantum Theories of Consciousness". Mind and Matter. 14 (1): 25–49. ^ Zurek, Wojciech H. (2003). "Decoherence, einselection, and the quantum origins of the classical". Reviews of Modern Physics. 75: 715. arXiv:quant-ph/0105127. Bibcode:2003RvMP...75..715Z. doi:10.1103/revmodphys.75.715. ^ "How the quantum Zeno effect impacts Schrodinger's cat". phys.org. Archived from the original on 17 June 2017. Retrieved 18 June 2017. ^ "What is the world's biggest Schrodinger cat?". stackexchange.com. Archived from the original on 2012-01-08. ^ "Schrödinger's Cat Now Made Of Light". www.science20.com. 27 August 2014. Archived from the original on 18 March 2012. ^ arXiv, Emerging Technology from the. "How to Create Quantum Superpositions of Living Things". ^ "Could 'Schrödinger's bacterium' be placed in a quantum superposition?". physicsworld.com. Archived from the original on 2016-07-30. ^ Chown, Marcus (2007-11-22). "Has observing the universe hastened its end?". New Scientist. Archived from the original on 2016-03-10. Retrieved 2007-11-25. ^ Krauss, Lawrence M.; James Dent (April 30, 2008). "Late Time Behavior of False Vacuum Decay: Possible Implications for Cosmology and Metastable Inflating States". Phys. Rev. Lett. US: APS. 100 (17). arXiv:0711.1821. Bibcode:2008PhRvL.100q1301K. doi:10.1103/PhysRevLett.100.171301. Wikimedia Commons has media related to Schrödinger's cat. Tony Leggett (August 2000) New Life for Schrödinger's Cat, Physics World, p. 23-24. Article on experiments with "cat state" superpositions in superconducting rings, in which the electrons go around the ring in two directions simultaneously. Information Philosopher on Schrödinger's cat More diagrams and an information creation explanation. Poliakoff, Martyn (2009). "Schrödinger's Cat". Sixty Symbols. Brady Haran for the University of Nottingham. This page was last edited on 20 March 2019, at 21:20 (UTC).